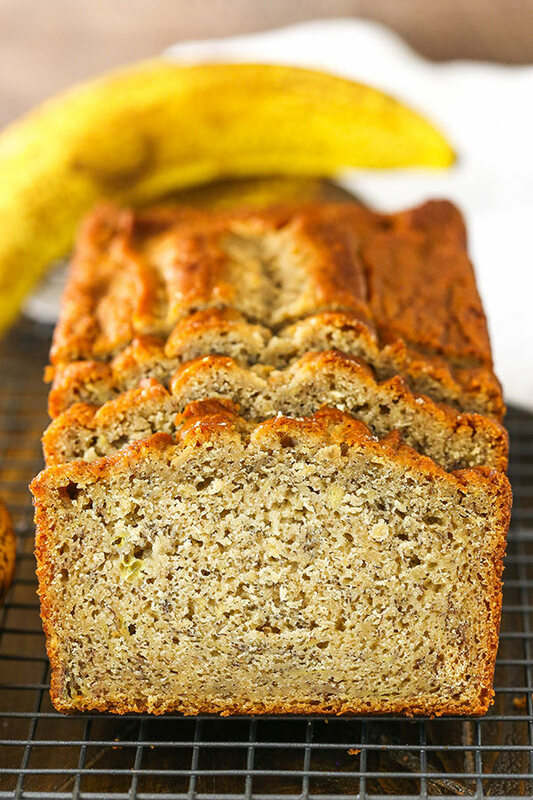 This Easy Banana Bread is perfectly moist and FULL of banana flavor! 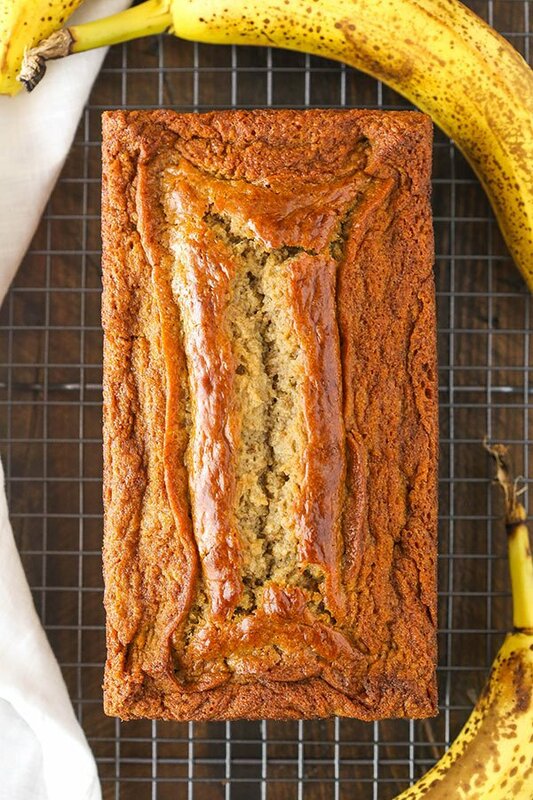 It’s a classic recipe that’s perfect for all those over ripe bananas! 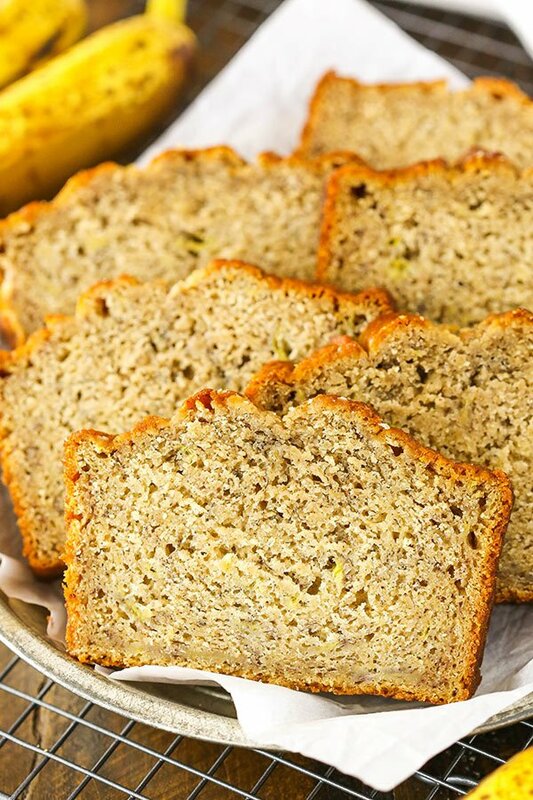 Any recipe with bananas is pretty much a favorite in our house and banana bread is no exception. 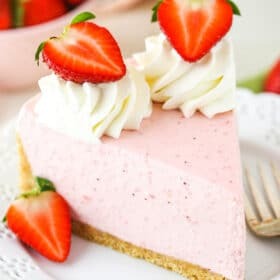 It’s the perfect snack, it’s great with coffee for breakfast and you could even call it dessert, if you wanted. As I was testing out this recipe, we had several loafs around the house. My parents came into town and we were ALL enjoying it. Not only are the hubs and I big banana fans – so is my dad. I thought there might be a throw down over who got every last bite, but fortunately I had made several loafs and there was plenty to go around. And even though the twins don’t really eat baked goods much at this point, we did give them a few bites of this banana bread. They too love bananas and are always interested in whatever we are eating. So every morning they saw us with this banana bread, they waddled over with their little mouths wide open waiting for a bite. Such cuties! 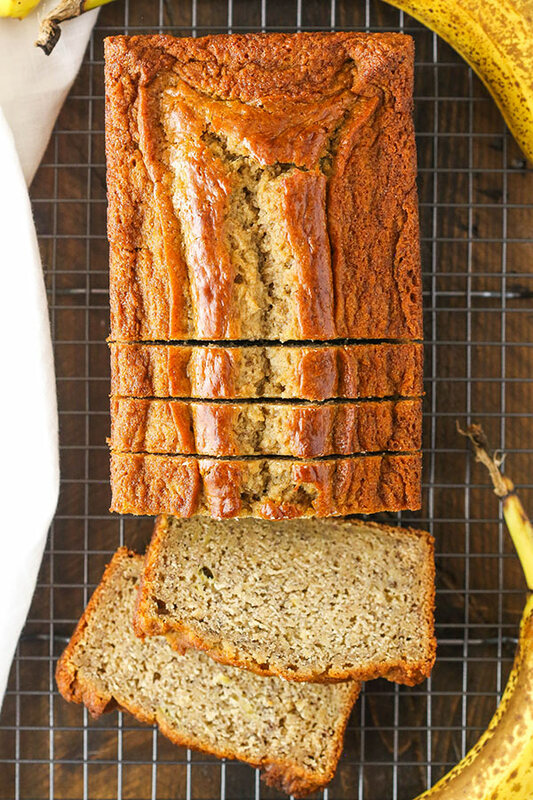 And since this banana bread is so quick and easy to put together, it’s perfect for using up over ripe bananas. Much like these Moist and Chewy Banana Oatmeal Cookies, this recipe is one you’ll come back to over and over for an easy banana recipe. To make banana bread, you’ll need pretty straightforward ingredients. Naturally the first thing you need is bananas. I wanted to be sure there’s plenty of banana flavor, so this bread uses a full 2 cups of mashed bananas – about 4 large bananas. I like to mash them up with a muddler, but you could also simply use a fork. Next up are the dry ingredients. We are using regular all purpose flour, baking powder and baking soda, a little salt and cinnamon. Combine them all and set them aside. I like using both the baking powder and soda because I think it makes a better textured bread. It makes such a nice, soft bread that holds moisture so well! And that little hint of cinnamon is just enough to compliment the banana flavor without taking over at all. To your mixer, you’ll add butter and brown sugar. I used all brown sugar in this bread for both the added flavor and the benefit of moisture. Eggs are added next and add additional moisture and stability to the banana bread, as well as tenderness. The sour cream adds just a hint of flavor and more importantly, more moisture. After adding the sour cream, mashed bananas and vanilla extract, gently stir in the dry ingredients. You want to mix it all together until it’s just incorporated. Be sure not to over mix it or you’ll end up with a tough bread. If you’re a true banana bread connoisseur and you know it won’t last long, you can store it in an air tight container at room temperature for about 3-5 days. You could also store in it the fridge for about a week. 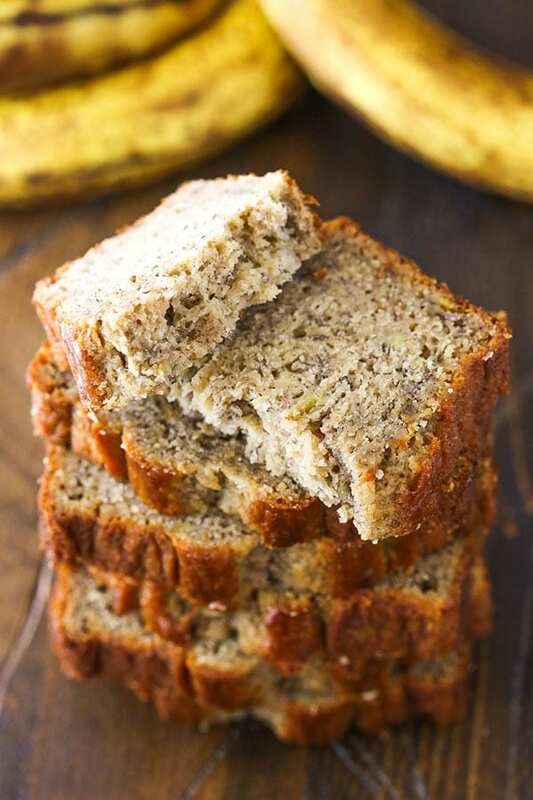 If you’d like to freeze the banana bread, you can freeze it either in loaf form or in slices. Slices are kind of nice because you can pull out one at a time. However you freeze it, wrap it in several layers of plastic wrap, then a layer of foil. Add the loaf or slices to a plastic freezer bag and store for 2-4 months. When you’re ready to use it, thaw it in the fridge or on the counter. 1. Preheat oven to 350 degrees. Spray a 9×5 loaf pan with nonstick spray and set aside. 2. In a large bowl, whisk together the flour, baking soda, baking powder, salt and cinnamon. Set aside. 3. In a large mixer bowl fitted with the whisk attachment, add the butter and brown sugar and beat together until light in color and fluffy, about 4 minutes. 4. Add the eggs one at a time, mixing until just combined before adding the next. 5. Add the sour cream, mashed bananas and vanilla extract and mix util combined. 6. Add the dry ingredients and mix just until combined. Do not over mix or you’ll end up with tough banana bread. 7. Add the batter to the prepared pan and bake for 60-65 minutes. To test for doneness, a toothpick inserted in the center of the loaf should come out clean. 8. Remove loaf from the oven and allow to cool completely in the pan. Slice and serve when ready. 9. Store the bread in an air tight container at room temperature for 3-5 days, or in the fridge for up to a week. Sounds wonderful. if I would like to bake this recipe for muffins tonight, how long in the oven and how many would it make? I haven’t tried it as muffins, so I’m not sure. Sorry! I have both fresh ripe bananas and frozen bananas can I use both types in the recipe at the same to make a double batch, and would I need to change anything ? Tyvm love your recipes.